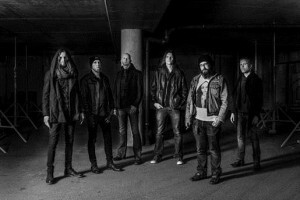 Century Media Records and SWALLOW THE SUN are proud to announce a worldwide deal to release the band’s upcoming albums. Finland’s death-doom luminaries, SWALLOW THE SUN, were born at the turn of the millennium when guitarist Juha Raivio gathered some friends together to start a band. With their debut, The Morning Never Came, the group was chosen as the newcomer of the year in Inferno Magazine, and the album received a full 5 K’s review in Kerrang!, which proclaimed it as “one of doom metal’s finest moments to date”. With their second full-length, Ghosts Of Loss, the band climbed to #8 on the Finnish album charts. This momentous occasion, together with heavy touring both in Finland and abroad, laid the groundwork for SWALLOW THE SUN‘s skyrocketing success. In January 2007, they released Hope, which impressively hit position #3 on the Finnish album charts- a feat never before achieved anywhere in the world with a doom album. The following year, the Plague Of Butterflies EP landed at the #1 spot on the Finnish charts in its first week, and it was succeeded by an extensive Finnish and American tour. During summer 2009, SWALLOW THE SUN spent three weeks in Fascination Street studios in Sweden with producer Jens Bogren, recording their fourth full-length release, New Moon. The album was released worldwide through Spinefarm Records in November 2009. Emerald Forest And The Blackbird, the band’s fifth and latest album, was released on February 1st, 2012 via Spinefarm Records and entered the official charts in the band’s home country at position #2. Now, SWALLOW THE SUN is working on their new, currently untitled sixth studio album, which will be unleashed winter 2015. Stay tuned for more news coming soon!